I bought some excellent figs at the Brookfield Markets from Sunrise Strawberries from Stanthorpe, who have beautiful figs and strawberries at their stall at the Market, which is held every fortnight at the Brookfield Show Ground. Tempted as I was just to eat them, I decided to make fig and ginger jam, which is superb with cheese, particularly blue cheese. 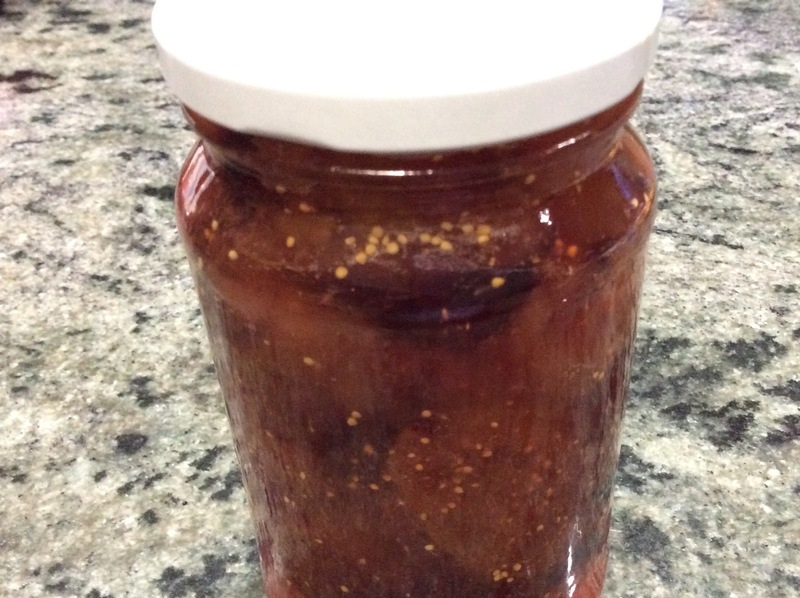 I already have a fig jam recipe on this site, so I won’t repeat the method in detail, but here is the short version of how to make it, which is very easy. Take a minimum of 500g figs, ripe but not overripe, and chop into quarters. You can go smaller if you wish. Place figs in a bowl and cover with an equal amount of sugar. Add approximately two tablespoons of prepared ginger pieces in syrup, finely chopped. 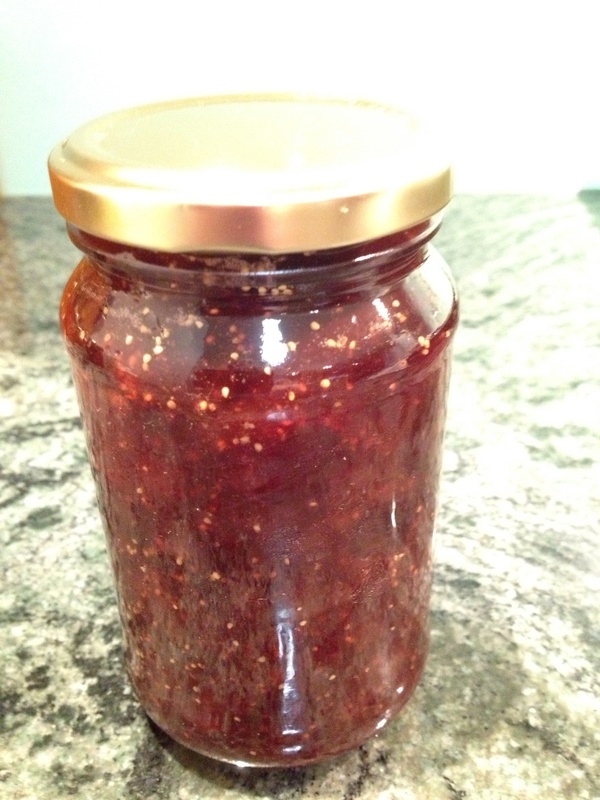 This is a great product (from Buderim Ginger), which really adds to the flavour of the jam. 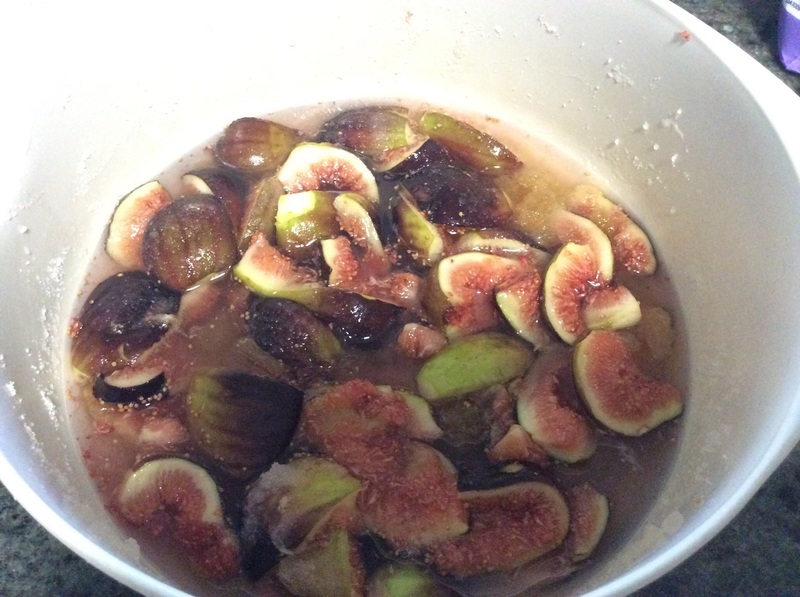 Leave 3-4 hours until the sugar “dissolves” and the figs disgorge some of their liquid. You shouldn’t be able to see the white sugar anymore. Place into a large pot to make the jam, and add juice of a lemon or lime. I used two limes as they are in season and limes are smaller than lemons. The acid in the citrus is important to get the jam to set. If your figs are a little overripe, I would add a little more lemon or lime juice. Don’t add any water to the mixture with this method. Bring slowly to the boil, making sure that all of the sugar is properly dissolved before the mixture boils. Once it boils, the jam will jell quickly as there is very little liquid to evaporate, so watch it carefully that it doesn’t burn on the bottom of the pan. This isn’t a jam mixture to walk away from! As soon as the mixture is at the setting point, take it off the heat and allow to settle in the pan for 5 or so minutes. Pour into prepared, heated jars, and seal immediately. I find if you have properly sterilised the jars, this jam keeps until the next Autumn when you are ready to do it again, but be sure to store it in the fridge once opened. Enjoy! Figs are still available in the shops in late Autumn, and they can make fantastic jam. 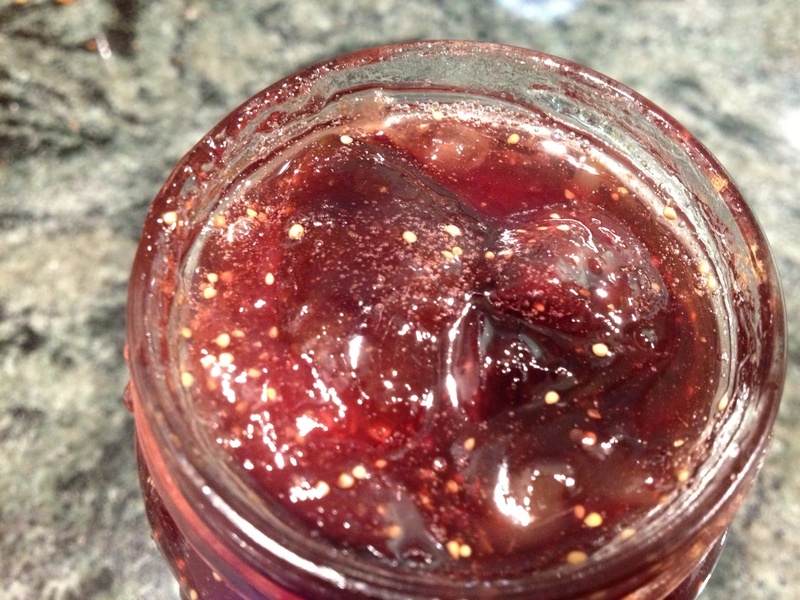 I also like to make fig and ginger jam, as it is superb eaten with cheese, especially brie, camembert, and blue vein. Match made in heaven! Figs are an unusual fruit, as they are inside out. They are one of the earliest fruits, and feature in the Bible and many early writings. I think they make an outstanding jam, but it isn’t exactly economical to make! It is also notoriously fickle, and has a nasty habit of burning on the bottom of the pan. Luckily burnt fig jam is another sub-genre, and pretty good too! Trim the top off the figs and cut into quarters. Sprinkle with sugar, the same weight as the figs, and leave overnight, or at least 4-5 hours so that they disgorge all of their liquid. Place in a pan with the strained juice of one or two lemons (depending on the weight of the figs – for a large batch use two lemons), and ensure that the sugar is fully dissolved before you bring the mixture to the boil. 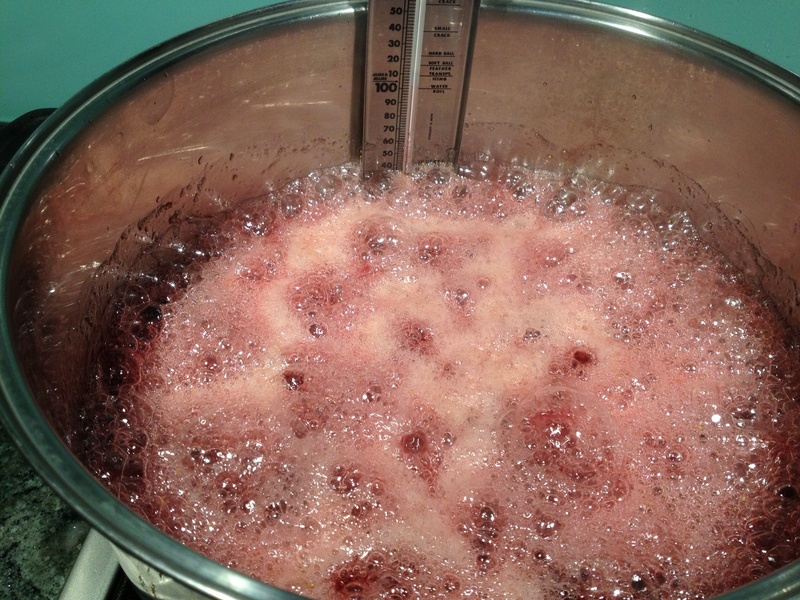 Once the sugar is dissolved, boil rapidly until the jam reaches the set point (104 degrees C). 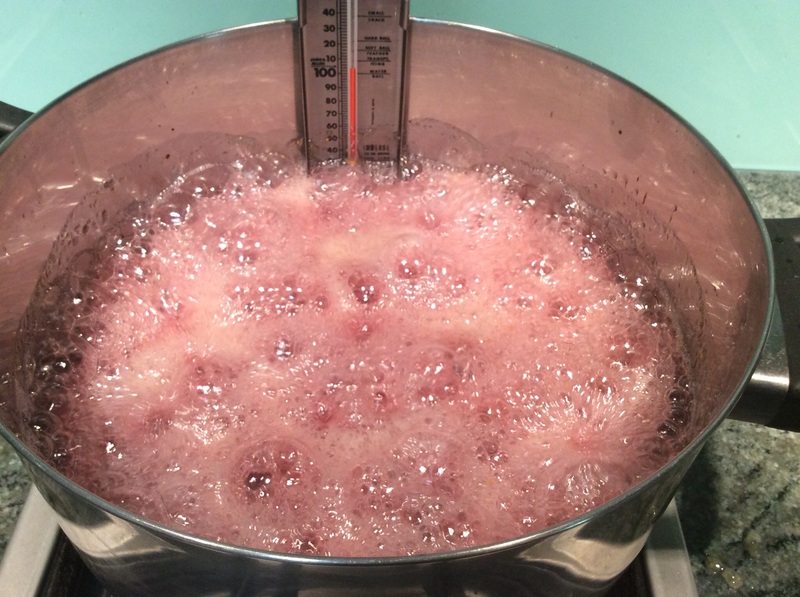 Either use a sugar thermometer (highly recommended), use the “wrinkle test” (place a small teaspoon of jam on a plate, and draw your finger through – if the jam wrinkles and holds it shape, it is done); watch for it “sheeting” off the spoon; or look for changes to look and feel and smell, in particular the bubbles will get much bigger, the mixture will try to boil over, and it will send up a some spits. Fig jam will jell quite quickly, particularly using this method, and needs to be carefully watched and frequently stirred. If it does stick to the bottom and burn, you can still save the mixture by not stirring in the burned bits from the bottom. Once the jam has jelled, take it immediately off the heat, wait five minutes and bottle immediately into heated, sterilised jars (see Orange Marmalade recipe for how to do this). Lid immediately. Hint – pans and jam making equipment are easy to clean when soaked in cold water – just rinse off, and no detergent or further washing required. Same with any spills on the stove, just soak in cold water and wipe straight off. As with all preserves, the hot mix is very dangerous and can cause very nasty burns. Never make jam with little children around, and always wear oven mits, and take care when handling the mixture.